What makes the mega-hit “Happy” by Pharrell Williams so darned….happy? I think part of its big impact has been that it sounds so inviting, as nowadays everyone from indie boys to Beyonce are trying to make music that sounds weird and alien. But Happy is stripped back with a good groove and a cool-sounding 60s Motown feel, so its success is down to the fact that it is pop music in its most fundamental state. as someone who was some basic experience of writing (crap) songs, it’s really easy to write something sad that sounds ‘deep’. U2, coldplay and a thousand other sub-radiohead acts have proven this. Am, C, G, Em, and F in some combo, hey presto, you’ve got a typical rock song. writing a catchy, happy tune that isn’t bubblegum pop crap is much more challenging. whilst it borrows from genres (as everyone does), no one can say it is a direct rip-off of another specific song. therefore, it should be applauded. I think the incredible growing number of covers of the tune are another indicator…like this one by the a Capella choir the Pentatonix. Released on March 17, it’s already north of 5 million views! Meanwhile, it seems that Pharrell is trading in the Smokey the Bear look for something with a little more of an…ummm…Mozart effect? Two Pianos, Twenty Years On: Remember “The Mozart Effect”? During my Performance Today years, we sure devoted a lot of coverage to “The Mozart Effect” — and the flurry of books and recordings that came in its wake. And here in the Age of the InterWebs, I discovered that there’s an entire website from a University of Illinois grad student devoted to “the study of the studies,” e.g., the breathtaking number of academic inquiries to discover if listening to Mozart really did make you smarter. And the cause of all of this was not the totality of Mozart’s amazing output. Nor any of a handful of great works, like the late symphonies, or the piano concertos, of operas like Don Giovanni. No, there was a single, little known, Mozart piece that started this fire. They assigned thirty six Cal-Irvine students to one of three groups, and offered the same “pretest” to each of the students. One group then listened to a selection by Mozart (Sonata in D major for Two Pianos, K. 448). A second group listened to what was called a “relaxation tape,” and the third group was subjected to ten minutes of silence. All of the students were given the same test, which was designed to measure spatial IQ. This test is described as mentally unfolding a piece of paper is that has been folded over several times and then cut. The object is to correctly select the final unfolded paper shape from five examples. The students who listened to the Mozart sonata averaged an 8-9 point increase in their IQ as compared to the average of the students who had listened to the relaxation tape or who had experienced silence. The increase in IQ of the Mozart group was transitory, lasting only about the time it took to take the test– from ten to fifteen minutes. Campbell may be gone – he passed away at the age of 65 in 2012, but www.themozarteffect.com lives on, twenty years later, both in the halls of academe, where far more thoughtful and nuanced research about the very real effects of music on brain development and healing are taking place. Not to mention in the commercial marketplace, where Mozart’s brain-enhancing abilities are still touted. Check out this fascinating 20th anniversary discussion on WQXR for a sample of some recent thinking. Meanwhile, check out this smartly-turned performance by Martha Argerich and one of her young proteges, Gabriele Baldocci, play that (in)famous first movement. Then go do a crossword puzzle! It could be said that the history of the four-hand recital began on May 13, 1765 in Hickford’s Great Room in London. That was when and where 9-year-old Wolfgang Mozart and his sister, Maria Anna (“Nannerl”) played together. And musicologists think this a four-hand Sonata in C (K. 19d) was probably written for this occasion. This was the first public duet recital on record and precedes by three years the first piano solo recital, which Johann Christian Bach presented in 1768. As the following pieces are the first to have appeared in print, of this kind, it may be necessary to say something concerning their utility, and the manner of performing them. And though, at first, the near approach of the hands of the different performers may seem awkward and embarrassing, a little use and contrivance with respect to placing them, and the choice of the fingers, will soon remove that difficulty. The whole preface is worth reading. Check it out here. So, Mozart made the music; Burney made the case. Smart. Very Smart. Check out a couple of videos below of the history-making K. 19d. I love the randomness of the Toronto shopping mall food court in the former, and the Mozartean ages of the Japanese tykes in the latter…. Happy Birthday, Mozart! Check out this compendium of audio, video, and even a few downloads from WCRB Classical New England…. From a November 2012 appearance in our Fraser Performance Studio, a thrilling “Exultate Jubilate” from Ian Watson’s group The Arcadia Players, featuring Kristen Watson as the soprano soloists. Another “Drive Time Live” session with Cathy Fuller behind the mic! AUSTIN, Tx – on the road again, (for the UTunes project) and taking the opportunity to catchup on some reading. 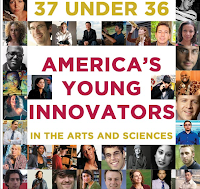 First up is the latest edition – a special issue – of Smithsonian magazine, titled “37 under 36: American’s Young Innovators in the Arts & Sciences.” The whole issue is a good read, and I’m reminded that back in the days when the RoeDeo WWHQ was in Takoma Park, Maryland I had a neighbor who was a Smithsonian editor. She told me that according to their research NPR and Smithsonian Magainze had about the highest overlap of reader/listenership in the business, which was later verified by some audience research at the Big Dog. So, no surprise, I suppose, but some excellent (and brief) profiles of some very public radio-friendly artists in the issue, including Sufjan Stevens(profiled by KCRW‘s Nic Harcourt – how pubradio can you get? ); jazzman Jason Moran (a fave o’mine – he played a couple of our NPR Jazz Piano Christmas shows, not to mention appearan ces on Fresh Air and Jazz Profiles); singer-songwriter Regina Spektor, and composer Nico Muhly, whose musical setting of the classic Strunk & White “Elements of Style” text (really!) got him touted as a Classical Musicians To Watch in 2006. (So did Mozart, btw, what with all that 250th Birthday fuss). Beyond the artists, all 37 are fascinating people, including people in Dr. Wizard’s line of work. I also like the profile of del.ico.ius founder Joshua Schachter. In the summer months, there’s probably more music-per-capita-per-minute in Aspen than anywhere else on the planet – The Aspen Music Festival & School crams 350+ concerts, lectures, and events into eight or so weeks between the end of June and mid-August. But the place doesn’t go entirely dark after Labor Day…your humble correspondent was on hand Wednesday night for the opening of Aspen’s Winter Series that takes place in 500-seat Harris Concert Hall. Most of those seats sic Festival appearance. Part of that appeal, I suspect, is how profoundly uncategorizable hewere filled Wednesday for a recital by pianist Vladimir Feltsman. Feltsman has long been an Aspen favorite – in fact, he’ll be back in the Meadows this summer for his fourteenth consecutive Mu is – he’s gone through his “big burly Russian” phases, playing concertos by Tchaikovsky et al; he’s embraced the keyboard music of J.S. Bach with a vengeance, with some compelling readings (and recordings) of the Partitas and Inventions; and last fall he presented a cycle of Mozart’s piano sonatas on a fortepiano – that is, a modern replica of an instrument that Mozart owned – a piano built in the 1780’s by Viennese manufacturer Anton Walter. But that’s not how we first found out about Vladimir Feltsman. Twenty years ago, he was a reluctant celebrity of the Cold War, after the U.S. State Department and President Ronald Reagan personally took up his cause for emigration. (Feltsman had applied for an exit visa in 1979 and his career was subsequently put on ice by Soviet authorities). Feltsman’s first commercial recording, of the 24 Preludes by Frederic Chopin, in fact, was recorded in 1984 inside the American Embassy in Moscow, and subsequently smuggled out of the country in a diplomatic pouch and released on CBS Masterworks – back when the phrase “two-record set” was a big deal. By the summer of 1987, the Americans had made enough noise, and the Soviets felt enough heat, to let Feltsman go…and suddenly there he was in the White House, giving his debut American performance with the President and First Lady leading the applause. Major pianist, yes, but I think one happy enough to pursue his own unique path. He’s a sophisticated, searching, and accomplished pianist, but I suspect that he’s had enough “celebrity” in his career. It’ll be interesting to see if and how Feltsman chooses to commemorate those headline-grabbing events of the summer of 1987. P.S. Back on the subject of the headline – Aspen was one of the first places I know to have its own Town webcams – you can even move them around to create your own custom views of the town. It’s a great bookmark when you’re bored!